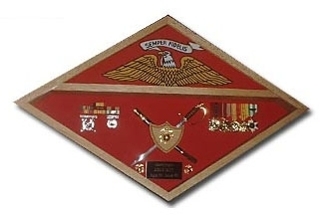 The Marine Corps Flag Display Case is a Great for your First Sgt , or any marine corps personal. This case was design spicily for the marine corps. the marine corps flag display case is a handmade flag display case that is made by American veterans !!! The marine corps flag display case is made from a real wood, and made to make any marine personal proud as it can hanged on a wall. display area is approx. 26 wide x 22 tall, including the flag area. Orders for the marine corps flag display Case are usually shipped out within one business day to places within the USA and Canada.